At 7 a.m. on a recent Friday, a group of US Bank workers began serving breakfast to a line of folks filing into the Catholic Charities Opportunity Center. 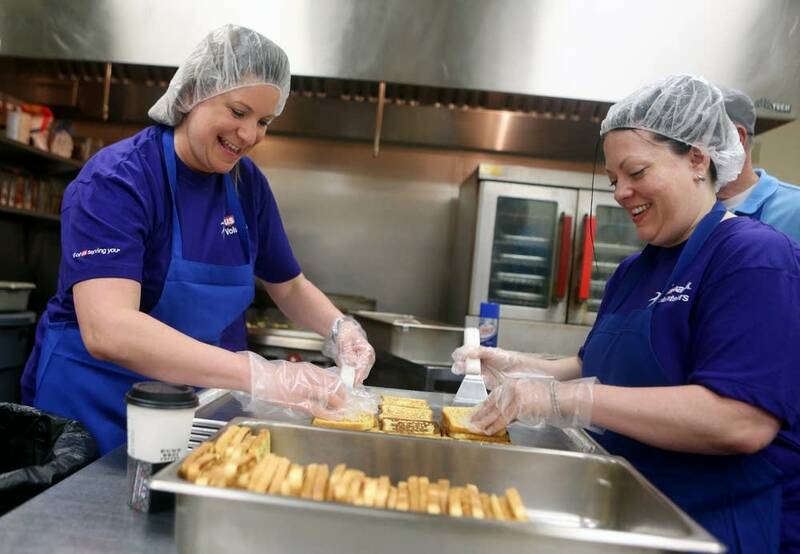 The volunteers from US Bank had arrived an hour earlier to don hairnets and start cooking French toast and eggs for the charity, which offers free meals and other services to people who are homeless. Most of the clients are homeless men, some of whom lug their possessions in plastic bags. 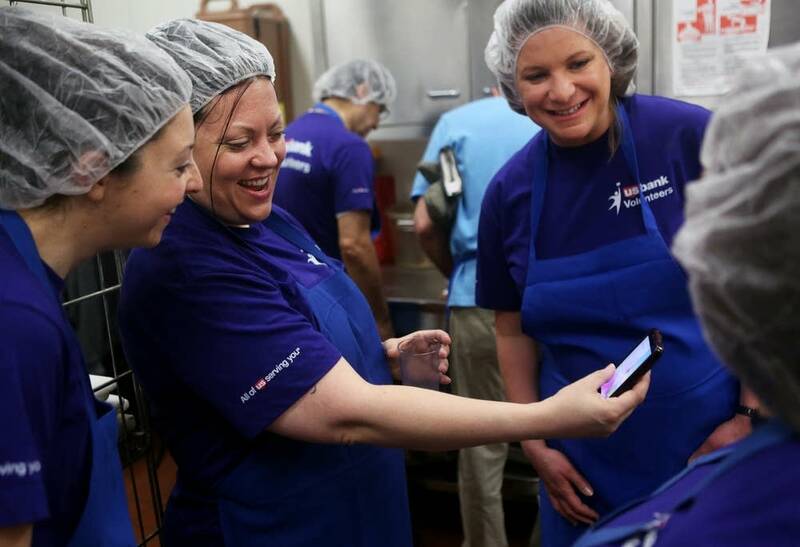 "When you start seeing the faces of the people we're serving, it's nice to say, 'Good Morning,'" said Lisa Erickson, a US Bank employee. "Everyone's happy and grateful." U.S. Bank is one of a growing number of employers that are offering paid volunteer time as an employee benefit. According to the Society for Human Resource Management, 20 percent of the companies it surveys offer paid volunteering time, a share that has increased over the past few years. 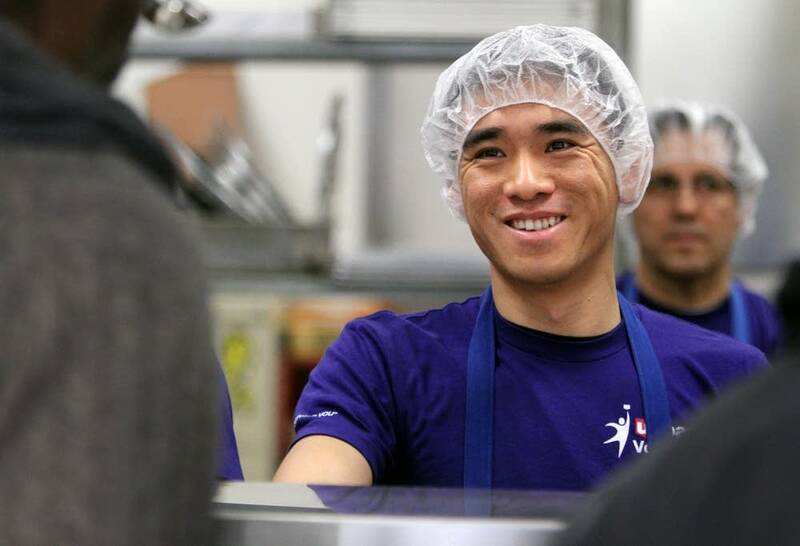 US Bank fully compensates workers for up to 16 hours of volunteer time per year depending on their length of tenure with the company. It's just one way the bank supports volunteering. Erickson said that thanks to the bank's policy, she has become a person who volunteers. If she couldn't do it on the clock, she wouldn't have time. "I'm a mom and work full time," said Erickson, who enjoys interacting with Catholic Charities clients. "Having this added in my day has been a very good thing." The men in the breakfast line appreciate her work. "Thanks for feeding us less fortunates," one man said. A study by UnitedHealth Group to be released Wednesday notes that when employers support workers' volunteering efforts, employees are likely to feel better about their jobs. But such studies come alongside other research suggesting American workers are about as unhappy with their jobs as they've been in a long time. "Sixty-eight percent of us workers are either under engaged or disengaged," said Patrick Riley, chief executive of Modern Survey, a Minneapolis-based company that helps businesses measure employee engagement. "That's pretty substantial," he said. In essence, those workers feel less of an emotional connection with their employers. The more engaged workers are, the more effort they put in on the job. Riley said his firm's March poll of 1,000 workers showed dismal employee satisfaction results, worse than six months ago. A big driver of such sentiment is workers' low sense of personal accomplishment through their work. Supporting volunteer work can help employers address that concern, Riley said. "Consistently there's a strong correlation between a sense of strong personal accomplishment [and] employee engagement," he said. Boosting employee engagement also can save companies money. Low employee engagement levels mean high turnover, which is costly for employers, said consultant Jason Averbook of Appirio, a company that offers services to help its business clients develop better relationships with their customers and workforce. Replacing an employee who earns $50,000 can cost a company about that much in time and expense, he said. Human resources experts say letting workers use company time to volunteer is a pretty inexpensive way to drive engagement higher and keep workers around. It also may be more fulfilling for employees than a pay raise, as an enjoyable experience outweighs pay in many organizations, Averbook said.